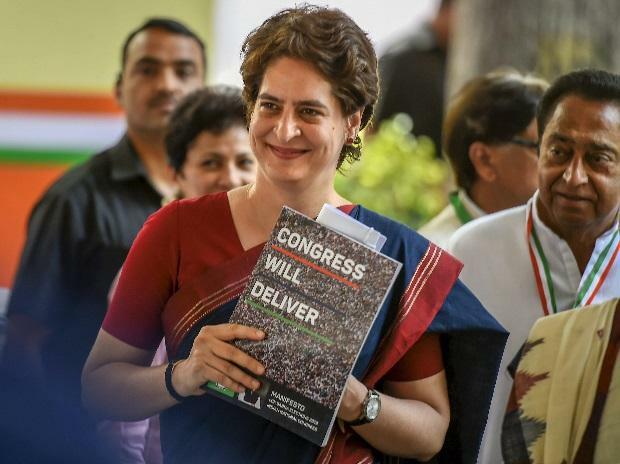 The Congress, in its 55-page manifesto, which was released on Tuesday afternoon, not only promised to solve the issues of joblessness and farm distress but also attempted to reach out to the business community. 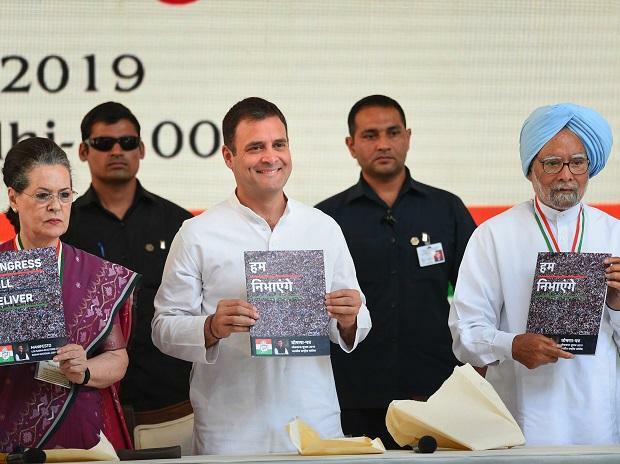 Releasing the manifesto, Congress President Rahul Gandhi took on Prime Minister Narendra Modi and the Bharatiya Janata Party (BJP) for raising the issues related to nationalism and Hindu identity. He said "all are Hindus", but the real issues are farm distress and joblessness. The election document also unveiled the party’s slogan for the polls: “Congress will deliver”, or “hum nibhayenge”. Gandhi said the manifesto had five key ideas, akin to the five fingers in the Congress election symbol of 'hand'. He said these are minimum income guarantee, increasing MNREGA workdays from 100 to 150, a sperate Kisan budget and making non-payment of debt by farmers a civil offence rather than a criminal one, increasing the expenditure on education to 6 per cent of GDP and on health care to 3 per cent, and strengthening national security. He claimed the Congress’s NYAY scheme has changed the narrative of the 2019 Lok Sabha polls. On contesting from Wayanad in Kerala, he said it was a message of solidarity as southern India has felt left out by the Modi government. On the issue of Jammu and Kashmir, the Congress promised to review the Armed Forces Special Powers Act as well as the deployment of the armed forces. The party said it will abolish the provision of sedition in the IPC, scrap the "opaque electoral bonds" introduced by the NDA government, replace the Niti Ayog with a modern Planning Commission and enact an anti-hate crime law to deal with incidents of lynchings. On education, the Congress promised that school education from Class I to Class XII in public schools shall be compulsory and free. One of its key promises is that its government will “encourage” colleges and universities to award deprivation points to students seeking admission based on gender, permanent residence in rural districts and first generation learners. Senior BJP leader and Finance Minister Arun Jaitley termed the Congress manifesto “dangerous and unimplementable”. He said it was aimed at “balkanisation” of India. Senior Congress leader P Chidambaram, who headed his party’s manifesto drafting committee, said he agreed that the manifesto was unimplementable by the BJP government, but a new government at the Centre will implement it. Jaitley criticised the Congress manifesto for its promise of doing away with the sedition law. He pointed at fiscal profligacy of the promises the Congress has made. He alleged that though the Congress had set up a drafting committee, it appears that some important points related to Jammu and Kashmir were drafted by Gandhi's friends in the “Tukde Tukde” gang. Some of the interesting promises made in the Congress manifesto are doing with APMCs and making the trade in agricultural produce —including exports and inter-state trade — free from all restrictions. It has also promised to undo “distortions” in Land Act, 2013, and Forest Rights Act, 2013.